Neon Drive, like a lot of indie games, is an easy game to fall in love with at first sight since it looks so distinctive and awesome. Seriously, this game looks freaking great. Unlike a lot of its contemporaries, however, that lure you in with pretty visuals only to let you down when you actually start playing, Neon Drive actually has the gameplay chops and content to keep you hooked. The music / rhythm gameplay crossed with a surprising variety of different stages all wrapped up in an awesome looking 80’s retro futuristic aesthetic make Neon Drive a complete package that no one should pass up. See our full PS4 Neon Drive review for all of the details. Neon Drive immediately catches your eye with its fantastic retro futuristic 80’s visual style. It has the bright neon and blue grid and everything! It doesn’t look like a game made in the 80’s, though, as the visuals are super smooth and clean and mind-blowingly good looking and modern and the framerate is silky smooth. 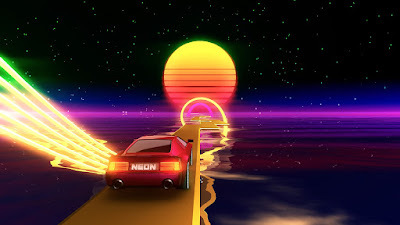 On the surface it seems like Neon Drive is some sort of driving game – since many stages to have you “driving” a car – but in reality it is more of a music / rhythm game where you’re moving the car (or other things) back and forth between several lanes to avoid obstacles. With a tap of the L1 or R1 buttons (or face buttons, but the bumpers are easier) you move your vehicle one lane left or right to avoid obstacles as they scroll towards you on the track. The rhythm part comes in because your movements are always to the beat of the thumping electronic soundtrack. 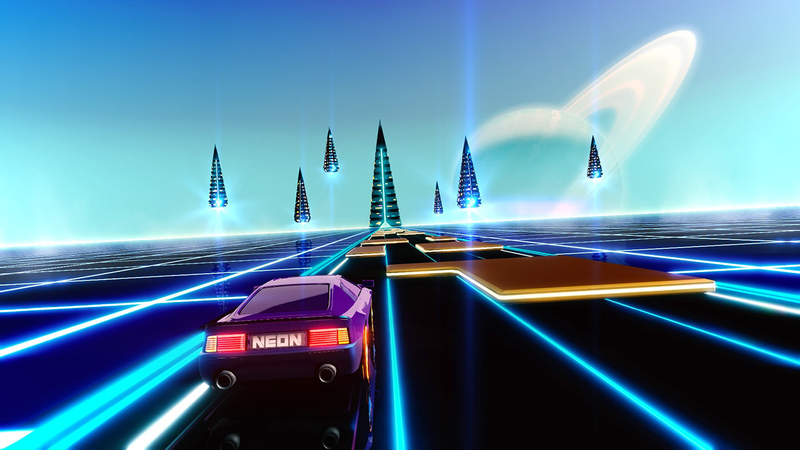 Once you get into the flow and are tapping away at the rhythm, Neon Drive is incredibly satisfying as you deftly dodge left and right around long strings of obstacles. As mentioned above, Neon Drive isn’t just about driving cars as other vehicles swap in from time to time. Each of the eight stages is split into multiple parts and the visuals and even gameplay can change in each part. 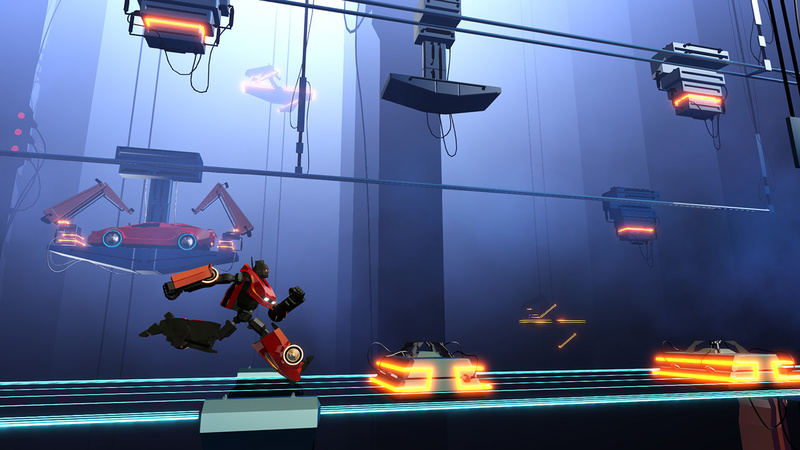 The game will switch from a third-person chase camera, to a top down camera, for example, or you’ll swap to a space ship where you have to shoot down asteroids (your shots are timed with the music, of course) and one section even has your car transforming into a robot that has to jump and duck through an obstacle course. The stage variety is really commendable and it is awesome how many different ways they used the core gameplay. While the genre swapping and constantly evolving gameplay gives Neon Drive a ton of variety, it also contributes to a lot of frustration the game can cause. This game can get really, really difficult and frustrating because the timing and precision required is incredible. You have to be pretty much perfect and once you get one section down and breathe a sigh of relief something totally new comes up that will make you go crazy all over again. Some of the genre changes introduce totally new visual styles and perspectives, too, and some are definitely harder to see what’s going on than others, which also makes some sections more difficult than they could be. In pretty much every level there is one section that is a total bottleneck that will halt your progress for a while until you figure it out. Overcoming all of that frustration and nailing those difficult sections are what makes Neon Drive so fun and satisfying and rewarding, however. The game very wisely has multiple checkpoints in each level and you respawn almost immediately when you fail, so trying over and over and over again until you get it right isn’t as much of a pain as it would be if the game had long load times. You just jump right back in and do it again. Even though the game only has 8 levels, which you could theoretically beat in less than an hour if you nailed everything the first time (you won’t), there are multiple difficulty modes, practice and free play modes, and an endless play mode that combines everything that give Neon Drive a lot of replay value. I do wish there were more levels and even more variety, but for $10 it’s hard to argue you aren’t getting your money’s worth here. Perfecting every level in every mode will take hours upon hours. All in all, I freaking love Neon Drive even if it has made me rage quit out of frustration more times that I’d like to admit. It looks and sounds so incredibly good and the gameplay is so satisfying when I do well that I just keep coming back for more. If you’re a rhythm fan, if you like the 80’s aesthetic, and especially if you’re looking for a challenge, Neon Drive is highly recommended. Buy it.